I’ve been obsessed with y’alls blog for a while now. I check it every day! Me and the hubs finally bought a house this spring and just like you guys, we’re in love with it. We’re full time photographers (as opposed to designers or renovators) but I could paint and decorate for days without food or drink! I just love making things over! We transformed the kitchen on a pretty tight budget. $1,207 to be exact! Painting the cabinets and switching out the counters made for quite a change. And the stainless steel appliances that we already had definitely popped thanks to the change. Hanging a new light fixture above the sink also really changed the feeling of the room, and the new sink adds so much personality. Isn’t it amazing? It’s just another example of how Ikea can come to the rescue when it comes to creating affordable room transformations – that and doing the work yourself to save some serious loot. We’re totally in love with what Jordan and her husband did that we’re just about ready to invite ourselves over for breakfast. Nice work guys! And what do you people at home think? Does it have you looking at your kitchen in a whole new way? What’s your favorite part? i wish my kitchen would be so easy to make over! we are starting with nearly nothing! congrats on the super make over. wow. wow. also i think my fav part is the countertops! 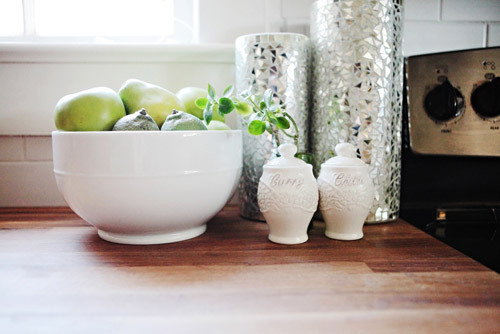 i am constantly impressed with the ikea wood counters in online pics! Where did you get those white mirrors next to your peninsula? Wow that is some makeover! Love the light!!!! I have a QUESTION for Jordan. I notice that BOTH light fixtures were replaced. Where was the center one (not the one over the sink) purchased? Fantastic! I wish I had the guts to paint my cabinets! WOW! This is amazing. I looove the countertops and that light fixture over the sink. Great work, Jordan! I love the countertops as well…I may have to consider those for my kitchen…and they look great with that sink. I’m curious as to what is going on where the ceiling light fixture used to be…is that a light…fans…what? any idea where those mirrors on the wall outside of the kitchen are from? they are gorgeous! You are right. My jaw almost hit the floor. That kitchen is absolutely amazing. It went from a kind of dated and heavy feeling to totally fresh, light and airy. Wonderful job. I never thought of Ikea for kitchen counters but I will definately check them out now. Gorgeous! Are those the Mercury Glass Melon Knobs? I’ve been eyeing those for a hack of the Ikea Rast dresser I’m about to do. They did a really super job. You totally do not think “budget makeover” when you look at this. I love that! Oh my gosh! This is absolutely amazing makeover, I can’t believe it was done for just a little over a thousand dollars–it looks like it would have cost multiple K’s. Love the photographs as well! You can definitely tell their talented photographers. 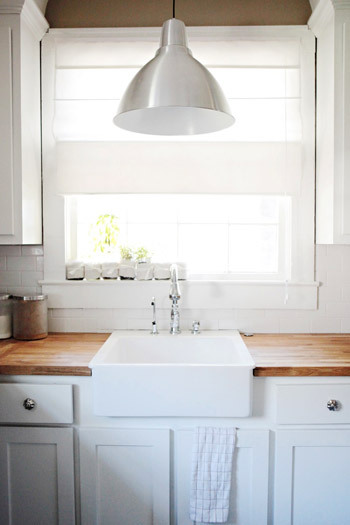 I love the apron sink (my favorite) and big industrial size pendant. Great job guys! I love how you all only put knobs on the drawers. I have no hardware in my kitchen right now and this is a cost effective way to add a little jazz to it! Awesome job! Beautiful! Jordan – where are those pretty white mirrors from? Loving them! Love the new sink! The link to Jordan’s site isn’t working… just to let you know! WHAT?!? Are we sure that’s the same kitchen ;) That is epic. Seriously has such a new energy and look. Love it! WOW!! Truly inspiring. I love every detail- the countertops, the Anthropologie knobs, the sink, the light fixture, the beadboard! Love it! Nicely done. What about the light fixture in the middle of the room? I’m thinking about putting one in my rather dark kitchen and am wondering how much light that puts off. Is it enough to make the kitchen feel bright at night? Amazing improvements! Good bones in a space are everything – I die over the curves of the ceiling over the sink. The link above for Jordan’s site is not working, just thought I’ll let ya know, hehehe. It just reinforces my wishes to paint our cabinets and replace our countertops. New lights and hardware and we would have a whole new room. However, our floors are not in good shape and our appliances are old and starting to go. Baby steps! 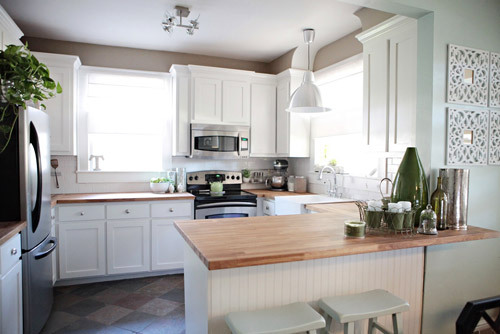 LOVE those countertops, especially with the white cabinets. So if they are photographers… what went wrong in the first picture?…lol. Pretty impressive change for the price, though. I am noticing that doesn’t really include accessories which also make a big difference to a room and the price. Congrats on the light & bright reno. wow! i’m totally inspired to get going on painting our cabinets. our new backsplash and counters just don’t shine with our yellowed 1950’s varnish covered cabinets! awesome job! Love this kitchen! When I clicked on the link for Jordan’s blog it redirected me back to this blog! How did they modify thier undersink cabinet to accomodate their new farmhouse sink? I really want a sink like that, but am unsure how i would make it work with the existing cabinet I have! So glad you’re all loving the makeover as much as we are! Here’s hoping she drops by with the answers to everyone’s questions soon! Very impressive! I think they did a great job! It’s gorgeous! So much lighter and fresher. Luckily they started with good bones and appliances. With ours, not so much. We had to completely overhaul! Where did they get those beautiful sparkly containers from that last picture? Incredible. It is a stunning kitchen. Love it! And would love a kitchen like that some day. Great job!!! Wow! I’m saving this post to reference back to – my husband and I just purchased a house with cabinets in a lovely pinky peach shade that are just screaming for a coat of paint. Wow-this is amazing! You guys (and examples like this) have really given me hope that you don’t need to move into a brand new house with granite countertops and stainless steel appliances to make it something really special. I think of you often as we begin our search for our next house! Love the makeover! We considered getting the same countertops but couldn’t afford it so we got ours reglazed. Different look but it works for our starter home! On the subway tile, did you buy each tile individually or does Home Depot have sheets of tile? I am wanting to do the same thing but have never tiled before! Congrats on your amazing kitchen! Wonderful change with very little cost. Would love to know more about the light fixture in the middle of the room….. hope Jordan stops in with the info on it. Wow, I am in complete fascination with this makeover!! We actually have a very similar kitchen and have done most of the same things they have, but I have been waiting for the perfect counter solution and this is totally it! I never would have thought it could be done so inexpensively, I am SO glad you shared this! Another story of how far paint can take a space, so much brighter and completely sparkling! LOVE IT! oh and fyi, I dont think the link (landonjocob) is working…or maybe its just dont working for me..lol..idk?! It looks amazing! So bright and clean! Gives me hope for our renos we plan on starting soon! 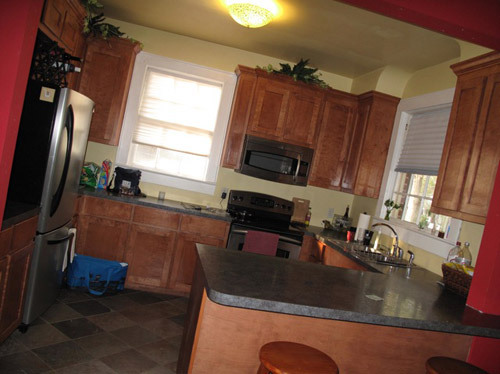 They were brave to paint their cabinets, but they turned out so great! I love the look of the white cabinets, but I’m always so afraid to ruin what we have! Great job, love the light and airy feel of it! Love, love, love it!!! What an amazing transformation! And I think it will be the final piece in the puzzle to get my hubby to not put up a fuss about me tinkering with our kitchen. He’s going to love the look, but more importantly, the bottom line!! So double thank you for sharing!!! Sorry the link to their site wasn’t working. All fixed! I have the same cabinets as the before pic in my new house. Not too crazy about them- it was a builder spec. I don’t think I would have the guts to paint them, although they look fantastic. My next DIY is going to be the subway backsplash just like the OP too. Can’t wait to get that done! I am hoping it brightens up my dark cabinets. Love it–I’m also wondering about the white subway tiles. I need to redo my countertops and get a new sink, and I’ve been wondering what to do about the backsplash. I love theirs and it would go well in my kitchen too!